This article describes the prominent Ikshwaku kings mentioned in Mahabharata. Ikshwakus were a royal dynasty perhaps older than the Ailas, Purus, Bharatas and the Kurus mentioned extensively in Mahabharata. Dasarathi Rama, the hero of Ramayana is a member of Ikshwaku dynasty. The study of the references of the Ikshwaku dynasty and the kings of this dynasty is of utmost importance in the historical dating of Rama's life and in the analysis of the historicity of Ramayana, since it gives an independent view of Rama's lineage. The Ikshwaku Lineage as per Mahabharata. To access the file directly or link to the file, click here. Possible connections with the Kauravas and the Pandavas and their ancestors too is analyzed. One interesting derivative of this analysis is that Rama of Ramayana could be a contemporary of Pandava-Arjuna's grandfather's grandfather viz. Pratipa. Further analysis is needed to ascertain this result. Mahabharata mentions several Ikshwaku kings including the founder king Ikshwaku and the most famous among the Ikshaku kings viz. Dasarathi Rama, the hero of Ramayana. At Mbh.13.30 we have another version of the history of Haryyaswa. As per this, Haryyaswa was the ruler of Kasi. This is not an issue since both Kasi and Ayodhya was often ruled by the same king. His son was Sudeva and Sudeva's son was Divodasa. Divodasa's son was Pratarddana. Thus we see that the narration about Madhavi breaking here. Haryaswa was slain by his mortal enemy Vitahavya (Manu > Saryati » Vatsa > Haihaya (and Talajangha) > Vitahavya > Gritsamada > Sutejas > Varchas > Vihavya > Vitatya > Satya > Santa > Sravas > Tama > Prakasa > Vagindra > Pramati (wife Ghrtachi) > Ruru (wife Pramadvara) > Sunaka > Saunaka). During the reign of Haryaswa's son Sudeva, the sons of Vitahavya coming from their kingdom viz. Vatsa, attacked the city of Kasi and defeated him. Sudeva's son Divodasa fortified the city of Kasi against the attack from Vitahavya's sons. Haryaswa's territory lied between Yamuna and Ganga. The Vitahavyas captured that territory. Divodasa's territory lied between Ganga and Gomati. Again the Vitahavyas attacked and Divodasa fled to the asylum of Bharadwaja, his priest. By the blessings of Bharadwaja, Divodasa's son Pratarddana was born (in contrast to the story of Madhavi). Pratarddana could be Bharadwaja's own son since here it says:- "Immediately on his birth he grew up like a boy of full 13 years and quickly mastered the entire Vedas and the whole of arms. Aided by his Yoga powers, Bharadwaja had entered into the prince." Pradarddana defeated the Vitahavyas by sacking their city. He killed all the Vitahavyas. Then the founder king Vitahavya sought the protection of sage Bhirgu. The Bhrigus and the Bharadwajas (who were a branch of Angirasas) were antagonistic to each other. Angirasa Brihaspati was the priest of the Devas while the Bhargava Sukra was the priest of the Asuras. Thus the war between Pratarddana and the Vitahavyas were like a war between the Devas and Asuras. Vitahavya later obtained Brahminhood at the hands of Bhrigu and became an ascetic and had a son during his ascetic life named Gritsamadha. His descendants from Gritsamada to Saunaka were great sages. Similar to the case of Haryyaswa, Sagara too is mentioned in Mahabharata without connecting him with any predecessor Ikshwaku king except one reference that make him the son of Jadu. At Mbh.12.56 we have:- "Jadu's son, king Sagara, of great intelligence, from desire of doing good to the citizens, exiled his own eldest son Asamanjas." As we explore about Jadu we find in Mbh.12.49 that his lineage leads to Vishwamitra and Parasurama, viz. 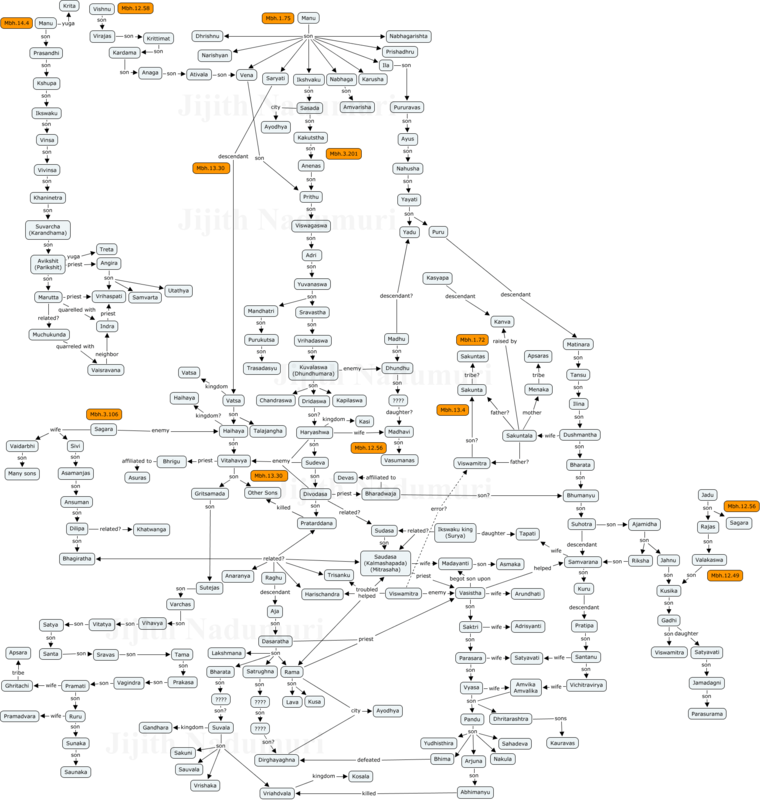 the Kusika lineage:- Jadu > Rajas > Valakaswa > Kusika > Gadhi > Satyavati (bother Viswamitra; husband Richika) > Jamadagni > Parasurama. Ikshwaku king Sagara's history is detailed in Mbh.3.106. His enemies were Haihaya and Talajangha. His two wives were from Vidarbha and Sivi kingdoms. Here we find a myth that the Vidarbha princess gave birth to a gourd from which 60,000 sons are born much like the 100 Kauravas are born to Gandhari! Probably this was the total strength of Sagara's army including a few of his sons. These sons were destroyed by sage Kapila (who is associated with the Yadavas) in a sea of sand (desert). Sagara's sons were following the sacrificial-horse as part of Sagara's Aswamedha (horse-sacrifice). The horse was stolen by Kapila or his men. In the dispute that arose, Kapila killed all of the Sagara's sons and the whole of his army. This incident probably took place in the same desert region where Dhundhu was slain by Ikshwaku king Kuvalaswa. This seems like a revenge of the Yadavas upon the Ikshwakus. Analyzing the narration describing the activities (in search of the lost-horse) of Sagara's sons, viz. the Saagaras, we learn that they were also explorers of the ocean (Arabian Sea?) which lied to the south west of the ocean of sand (Thar Desert?). This exploration was mythologically explained as the search for the lost horse, but could actually hint at marine-navigation and marine-exploration. They seems to have explored the marine resources (probably resulting in the destruction of some marine life). Thus these Ikshwakus were pioneers of marine exploration. At Mbh.3.281 we also have Varuna, (mythologically the lord of the oceans) describing himself belonging to the Ikshwaku race. In Sanskrit the word Saagara has two meanings:- 1) ocean, 2) the descendant of Sagara. This was probably because of the extensive exploration of ocean by Sagara's sons. Sagara's son from Sivi was named Asamanjas. He was very wicked and hated by the people of the country. he used to seize by throat the feeble children of the townsmen, and threw them while screaming into the river. Hence Sagara banished him. Asamanjas's son Ansuman was dear to Sagara. Asked by Sagara, Ansuman met Kapila and ended the hostility of Kapila against the Ikswakus. Sagara installed Ansuman as the next king. Ansuman's son was Dilipa. It was probably Dilipa who initiated the search for Ganga in order to migrate the kingdom from the drought stricken Saraswati. This postulate is inferred from the myth of bringing Ganga to the mortal world. The myth of brining Ganga to ones kingdom is an inverted reflection of bringing ones kingdom close to Ganga, ie shifting of the kingdom to the Ganga-river valley. Dilipa is mentioned as making every great effort towards the descent of Ganga a project which is completed by his son Bhagiratha. At Mbh.7.59 we have an alternate history of Dilipa:- Dilipa was the son of Havila (this could be a different name of Ansuman). In Mahabharata, Bhagiratha is mentioned as the son of Dilipa in agreement with many other sources like Ramayana, Vishnu Purana and Bhagavata. He completed his father's mission of bringing Ganga to his territory. Keeping the myth aside, he could have achieved it either by moving the his territory towards Ganga or by the difficult task of channelizing the glacial waters at the source of Ganga into his desert country. The theory of shifting of territory is supported by the fact that the Ikshwakus were in conflict with the Madhava-Yadavas in the desert territory (probably located along the dried up Saraswati river in Rajasthan). During the time of Sagara the Ikswakus lost to the Madhavas though they had an upper hand during the time of Kuvalaswa. Both the Yadus and the Ikshwakus might have wanted to move away from their dried up territories towards Ganga and other greener pastures. The theory of channelizing the glacial waters of Ganga is supported by the fact that there were some dried up channels of Yamana river that flew into Saraswati and Bhagiratha, with some effort, might have succeeded in bringing the waters through these river channels into his dry territory as a temporary solution for the drought. Rama, the hero of Ramayana is mentioned several times as Ramayana is narrated many times in Mahabharata in varying details. In one place, it is summarized in a few sentences, elsewhere it is detailed in a paragraph. The largest narration of Rama's history found in Mahabharata is 18 chapters long. Most of the references of Rama are found in the Vana-Parva (book 3) of Mahabharata. At Mbh.3.99 we have it narrated by sage Lomasa in a few verses. At Mbh.3.146 it is narrated by Hanuman. This narration is more than one chapter long. At Mbh.3.272 it is narrated by sage Markandeya. This is 18 chapters long and the longest narration of Ramayana in Mahabharata. There are also more than five passing references of Rama, Sita, Ravana and Ramayana in Book numbers 1, 3, 4, 7 and 18. Rama is often described as a descendant of Raghu. Thus he was called Raghava-Rama as he belonged to the Raghava branch of the Ikshwakus. Rama's lineage is traced from Aja a member of the Ikshwaku lineage at Mbh.3.272. Aja's son was Dasaratha and his sons were Rama, Lakshmana, Bharata and Satrughna. Rama's enemy viz. Ravana's lineage too is described here:- Pulasthya > Visravas > Vaisravana, Ravana & Kumvakarna (the two sons of Pushpotkata), Vibhishana (the son of Raka), Khara & Surpanakha (the son and daughter of Malini). The history of the Ikshwaku king Kalmashapada, the son of Sudasa, is described at Mbh.1.177. It is not clear if Sudasa is anyway related to Divodasa. Kalmashapada was also known as Saudasa as he was the son of Sudasa. He, like Harishchandra and Trisanku was a victim of the rivalry between Vasistha and Viswamitra. Vasistha was the priest of Saudasa. There, however, occurred a verbal dual between Saudasa and Vasistha's son Saktri. Saktri abused Saudasa calling him a Rakshasa, for showing lack of respect to him. (Usually, if a king or a Kshatriya showed disrespect to a sage or a Brahmana he is termed as a Rakshasa.) Vishwamitra exploited this dispute and made Saudasa slew Saktri and many members of Vasistha's race. The priesthood of Ikshwaku kings thus was taken over by Viswamitra from Vasitha. Before becoming an ascetic, Viswamitra was the king of Kanyakuvja, much like Vitahavya who too was the ruler of Kanyakuvja. Like Viswamitra, Vitahavya too later became an ascetic. The ancestry of Vitahavya is traced to Saryati, the brother of Ikswaku, while that of Viswamitra to Gadhi and to Aila-Puru-Bharata lineage (Ila » Puru » Bharata » Ajamidha > Jahnu > Kusika > Gadhi > Viswamitra). Since the ancestries are different we could consider this as part of a broader pattern of a rivalry between the adjacent kingdoms of Panchala-Kanyakuvja and Kasi-Kosala. Finally though, Kalmashapada realized his mistake and restored Vasistha as his priest. Upon the wife of Kalmashapada, viz. Madayanti, Vasistha begot a son named Asmaka who founded the city named Paudanya. After the death of Saktri, his wife Adrisyanti gave birth to Saktri's son Parasara. He decided to revenge his father's death and killed many Ikswakus treating them all as Rakshasas. This genocide was aborted in the middle by the intervention of sages. Parasara's action was similar to that of Parasurama who revenged the killing of his father Jamadagni by king Kartavirya (assumed to be of Yadava race) by a genocide of Kshatriyas belonging to the race of Yadu and Ikswaku. Similar to this is the revenge of Aurva another Bhargava like Parasurama against the Kshatriyas who killed his forefathers. Kuru king Janamejaya too try to kill all the members of the Naga race to avenge the death of his father Parikshit at the hands of Naga Takshaka. All these genocides were prevented by learned sages. Parasara's son upon Satyavati was Vyasa the author of Mahabharata. At Mbh.14.56 we have mention of Saudasa and his wife in connection with Utanka the disciple of Gautama who had Ahalya for his wife. Kalmashapada had another name viz. Mitrasaha by the reference at Mbh.12.233 and at Mbh.13.137. The history of Trisanku is described at Mh.1.71. Here he is mentioned as a hunter instructed (cursed) by his father (probably banished from his kingdom). Viswamitra helped him and became his priest. Trisanku was also known by the name Matanga. He is mentioned as maintaining the wife of Viswamitra, while she was in her season of distress. The history is repeated at Mbh.13.3. Here it was Vasistha who cursed Trisanku, the son of Ikswaku, to live like a Chandala. Here again he was helped by Viswamitra. Here Trisanku's history resemsbles that of Kalmashapada who was condemned (cursed) by Vasistha's son to be a Rakshasa. He too was helped by Viswamitra. From the narration at (Mbh.13.3) and at ( Mbh.13.27 to Mbh.13.29) it seems that Matanga was the name adopted by Trisanku as he choose to become a Brahmana, following the footsteps of Viswamitra. Sage Matanga is mentioned in connection with sages like Agastya, Vasistha and Viswamitra. There is indication at (Mbh.12.296) that Trisanku lived as sage Matanga and died during the life time of Vyasa. The history of Harishchandra is mentioned at Mbh.2.12. But his connection with the Ikshwaku dynasty is not evident in Mahabharata. At Mbh.13.3 Harishchandra is mentioned as the son of Viswamitra. His other name was Devarat. The other sons of Viswamitra were declared (cursed) to be Chandalas, for dishonoring Devarat. Mahabharata describes mostly about a Rajasuya sacrifice performed by Harischandra, which became an inspiration for Yudhisthira to perform a similar Rajasuya. Unlike in other sources Amvarisha is not considered as born in Ikswaku lineage but in the lineage of Nabhaga, the brother of Ikswaku. Not much is mentioned about Nabhaga either except that he was a son of Manu and the father of Amvarisha. The most prominent statement made about Amvarisha is the following:- (Mbh.13.3) Sunasepha the son of Richika, having been sought to be slain as an animal in the great sacrifice of Amvarisha, obtained his deliverance through Viswamitra. This makes Amvarisha a contemporary of Viswamitra. This aslo make him a cruel ruler who practiced sacrificial killng of humans. (Mbh.12.8) This earth formerly belonged to king Dilipa, Nahusha, Amvarisha, and Mandhatri. It is not clear if this make these kings contemporaries. Mahabhisha is mentioned as an Ikshwaku king. He is connected with Santanu, the great-grandfather of the Pandavas through the myth of a reincarnation story Mahabhisha reincarnated as Santanu. This could indicate some relation between Santanu and Mahabhisha. Were they same person? Were they contemporaries who both wanted to marry the woman named Ganga? My analysis indicate Ganga, (the first wife of Santanu) and her son Devavrata as belonging to the Gangeya tribe. This tribe seems to be a lineage parallel to the lineage of the Kurus, the Kushikas and the Panchala tribe. Its founder seems to be a descendant of Jahnu, the son of Ajamidha. Suvala is mentioned as an Ikshwaku at Mbh.3.263. His son was present in the procession-train of Jayadratha, the ruler of Sindhu, Sauvira and Sivi kingdoms on his way to the Salwa kingdom through the Kamyaka forest:- "The dark and handsome young man, the scourge of his enemies, standing at the edge of that tank, is the son of Suvala of the race of Ikshwaku." These were the words of Kotika, the ruler of Sivi kingdom and an ally of Jayadratha. As per several other references in Mahabharata, this Suvala was also the king of Gandhara and the father of Sakuni and Gandhari (the mother of the Kauravas). This Ikswaku connection explains why Duryodhana, the eldest among the Kauravas gave the name Lakshmana to his eldest son. The son of Suvala mentioned by Kotika as travelling with Jayadratha seems to be another Ikshwaku king who ruled in the west (ie the territories that lied along the Sindhu river). The Sindhu river valley, like the Ganga river valley was one among the regions where the Ikshwakus migrated after the drying up of Saraswati river. It seems there were matrimonial alliances between the Ikshwakus who migrated eastwards into the Ganga basin and the Ikshwakus who migrated westward into the Indus valley and beyond. For example from Ramayana we know about the marriage between Dasaratha (Ganga basin) and Kaikeyi (Indus basin). From (Mbh.1.187) we get to know that Sakuni, Sauvala, Vrisaka, and Vrihadvala, are the sons of the Gandhara king. This clearly indicates that Vrihadvala was a son of Suvala. Virhadvala was a king of the Kosala kingdom and an ally of Duryodhana as per many references in Mahabharata. He was slain by Arjuna's son Abhimanyu. Thus, this Kurukshetra-war-hero on the Kaurava side was a maternal-uncle of Duryudhana, much like the most famous Sakuni. This view is also strengthened by many references (like Mbh.7.35) that describe Kurukshetra war where Sakuni and Vrihadvala are mentioned together or addressed as Suvala's son. Rituparna is mentioned as the king of Ayodhya at Mbh.3.60 as part of the history of Nala (a Vrishni-Yadava king and the son of king Virasena) and Damayanti (a Bhoja-Yadava princess and the daughter of king Bhima). Banished from his kingdom of Nishadha by his brother Pushkara (assisted by ally Kali, the Gandharva king), Nala became a charioteer of Rituparna. Rituparna is mentioned as belonging to the Ikshwaku lineage at (Mbh.3.66). Rituparna helped Nala to regain his wife Damayanti and finally regain his kingdom. Thus after all the Ikshwaku-Yadava rivalry we get to see an Ikshwaku-Yadava friendship during the period of Rituparna and Nala. My analysis indicate that Rituparna, Nala and Damayanti lived after the period of the Pandavas and their descendant Parikshit, during the reign of Parikshit's enemy from Gandhara kingdom viz. the Gandharva Kali, (which was during the start of Kali Yuga (3000 BC). Khatwanga is mentioned only once (Mbh.1.55) where he is mentioned along with Nabhaga, and Dilipa. Anaranya is mentioned only thrice. At (Mbh.13.115) he is mentioned along with Dilipa and Raghu. Raghu is mentioned several times but only as an ancestor of Dasarathi-Rama, the hero of Ramayana. Sudasa is mentioned only twice, once as the father of Kalmashapada (Mbh.1.178) and once together with other Ikshwaku kings like Divodasa and Pratarddana Kosaleswara.(Mbh.13.165). Aja is mentioned once as belonging to the Ikshwaku lineage and as the father of Dasaratha. Aja is mentioned together with Pratipa and Santanu (the immediate ancestors of Pandu) at (Mbh.13.165). Varuna is mentioned as a member of Ikshwaku race at Mbh.3.281. As per mythology Varuna was the lord of oceans and an elder brother of Indra. Can he be one among the ancient Ikswakus who migrated to west and later became an expert in marine-navigation? Varuna is mentioned here as conversing with Rama to help him cross the ocean and reach Lanka. This narration is part of Markandeya's abridged Ramayana within Mahabharata. A king named Parikshit is mentioned as a king of Ayodhya and belonging to the race of Ikshvaku at (Mbh.3.191). Ikswaku king Avikshit is sometimes referred as Parikshit. Here Sala, Dala and Vala is mentioned as sons of Parikshit born to a woman of Manduka race (mythologically described as a frog). Rantideva is a king famous for his animal sacrifices. He is mentioned at (Mbh.12.233) thus:- Sankriti's son Rantideva, having given only lukewarm water to the high-souled Vasishtha, ascended to heaven. Kshemadarsin who appointed the sage Kalakavrikshiya as his priest.